Music is a big part of worship at our church. A few weeks back, we planned a service without any music. It was different. It was even uncomfortable at times. Singing songs on Sunday morning is what we know and what we are comfortable with. We like to make a joyful noise unto God. But have you ever considered making a joyful silence? But sometimes the greatest act of worship is not to sing a song, but to simply be still. When you visit the Grand Canyon, it is a religious experience. You stand over the edge of the canyon and you are overwhelmed by the size and the beauty. It brings you to a place where you recognize how small you are and that you are part of a creation that is much bigger than you are. As you stand at the edge, you don't sing a song to the Grand Canyon about how great it is. You stand there in silence and awe. You are amazed. There are no words. We need more silence. We live in a noisy world. When was the last time you experienced silence? So many of us are constantly surrounded by noise. We have grown immune to it. We don't even hear the noise around us. When we encounter silence, it is deafening. Do you ever find yourself turning on the TV or the radio at home simply to have noise? The silence can be uncomfortable. We create noise, so we are more comfortable. But in Psalm 46:10 it says to be still to know God. What does that say about our noisy lifestyles? How can you intentionally practice silence and stillness? Take the next 10 minutes just to be still. Don’t do anything. Eliminate as much noise around you as possible. Consider what you hear in the silence. We live in a time when there is a charged political atmosphere. There are strong opinions. Everyone has something to say. The problem is that we always have something to say, but rarely hear what is being said. We want to be understood. We want to make our point. We want others to empathize with us. We want others to approve of what we believe. So we are always looking for the angle to make our point known. We insist on proving we are right. The point is that we are good at talking. We are not as good at listening. But what if we sought to understand more than we sought to be understood? Instead of plotting to make our point known, we would work to comprehend another person's position? If this happened, it would go a long way towards unity not only in politics, but also in marriages, churches, and places of work. The irony is that those who seek to hear are often the ones who are best heard. When you actively listen to others, it will encourage others to respect you and your opinion. They respect what you have to say because you respect what they have to say. They will listen to you. How much more does the principle of listening apply to our relationship with God?Jesus tells us that the person who listens to God's Word is wise. Our prayers are often talking at God rather than talking with God. We will go out of our way to make our troubles known to God. But we don't have the same urgency to hear what God has to say about those troubles. God is constantly speaking. He is constantly making his presence known. If you don't hear God speak, it is not because God is not speaking. The problem is that we are not listening. You are not actively seeking God's gentle whispers. God's voice can be heard, but it is subtle. It does not scream out at us. If you are looking for God to reveal himself through a bolt of lightning or an earthquake, you are probably not going to hear his voice. He doesn't put billboards up along the roadside. Seeking the God’s voice is seeking it where it is found. It is found in opening the pages of the Scriptures. It is found in times of quiet. It is found when we disconnect from our phones, our TV's, and computers. It is found in Jesus. As you hear from God, examine your words and your actions in light of what he is speaking. When we live disobedient to God's Word, it hinders our ability to hear from God. The more we align ourselves with God's revealed Word, the easier it becomes to hear further revelation. God is speaking. Do you have the ears to hear? How do you intentionally listen to God? In your next conversation, let go of the desire to make your point, and simply understand the other person's perspective. Are you living obedient to God's voice? How does disobedience hinder your ability to hear? The wind and the waves were tossing the boat around. Where was Jesus? He was sleeping (Mark 4:35-41). How could Jesus be sleeping at a moment like this? The boat was sinking. This was not the moment to sleep. A lot of us feel like we can't get rest. There is never a good moment to take a nap. We are running all day long. We go to bed late and get up early. Even our days off are not truly days off. Work, work, and more work! There is always work to be done. How can you sleep at a moment like this? But we need rest. When God created the universe, he rested on the seventh day. As part of the order of creation, he gave us the gift of the Sabbath Day. To remind us of this gift, he gave us third command "Remember the Sabbath Day by keeping it holy." God created you, and he knows better about how you were designed to work than you do. It is good to listen of your designer. And he says that you need rest. Sometimes, the most spiritually beneficial thing we can do is take a nap. When Jesus lived, the work day began at sunset. This is different from the way we approach the day. We view the day beginning when the sun rises in the morning. That is the start of the day, and when the day starts, it is time to get to work. But when the day begins at sunset, the first thing to do is rest. We go to sleep. As we rest, we put all the tasks from our to-do list into God's hands while we take the time to be renewed and refreshed. There is a trust he will give us everything we need in the next day to complete those tasks. Instead of resting from our work, we work from our rest. Why can’t you get rest? Why do you have so much anxiety that prevents you from sleeping? There is a good chance that you are having a hard time giving the things in your life over to God. Instead of living by faith, you are trying to control everything and having a hard time of letting go of that control. God gave us 24 hours in a day. He gave us seven days in the week. God knows what he is doing. He gave us exactly the right amount of to get done everything he has called us to do. If we don't have enough time to get everything done; there is a good chance we are doing more than we were created to do. It’s time to loosen your grip on some of the stuff you are holding on to so tight. Finally, don't define yourself by your work. You are not valuable to God because of what you do, but because of who God made you to be. Your value is in who you are in Christ. You don’t have to prove anything to God. Jesus has already proved everything necessary. You can rest content, knowing God will provide. The work that is so important will still be there tomorrow. And even if you are to complete the work today, it will just mean that there will be new tasks to be accomplished. There will always work, so get your rest. Do you have a hard time finding rest? Why? 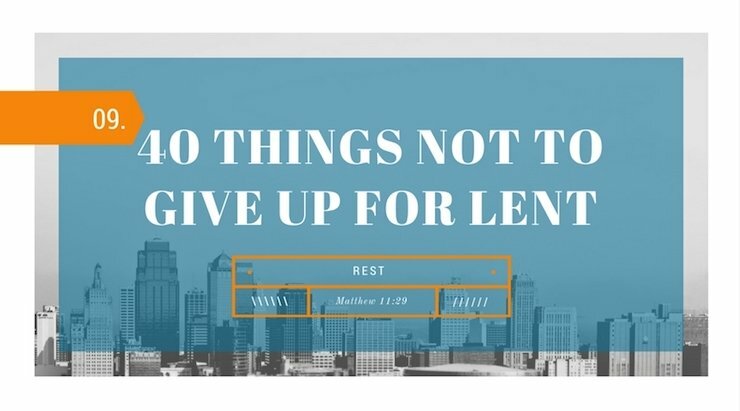 What can you do to prioritize rest in your life? Recently, I was enjoying daddy daughter date night with my daughter. The date consisted of a trip to an indoor amusement park. We chose indoors because it was a cold night. So when we arrived, we checked our coats at the coat check. As we were preparing to leave the park, we went to retrieve our coats. There was one lady who was checking out. We took our place in line behind her and waited while the transaction was completed. Just as this lady was finishing, another lady jumped in front of us. I don’t think it was intentional. She seemed out of sorts and extremely disconcerted. You could see the stress and anxiety oozing out of her. My first thoughts were: “Lady, who do you think you are?” I felt the urge to loudly say, “excuse me!” But in a split second, I thought better. I said to myself, “let it go. What is the hurry?” Here I was spending time with my daughter and this inconvenience would be the opportunity to spend a few more moments together. We had nowhere we needed to be. To make a big scene would not benefit anyone. Life passes by so quickly. But we are always in such a hurry to get somewhere. Life is not so much about the destination. It’s about the journey. Enjoy the ride. Enjoy each moment for what it is. I remember as a kid that I could not wait for Christmas to come. But more often that not, the anticipation of Christmas was so much more exciting than Christmas itself. I think about so many memories surrounding Christmas. So many of those memories are not about Christmas day, but about the days leading up to Christmas. Why was I in such a rush for Christmas to arrive? Think back to your past. Think of the moments you wish you could get back. Maybe it is time with the kids when they were little. Maybe it is time with a loved one that is no longer with us. In the same way, one day you will wish to have this time back. So allow yourself to linger in the moment now. When you are inconvenienced, consider the opportunity that might be presenting itself. The extra time in the coat check line was some extra time to spend with my daughter. Getting caught in that traffic jam is a few more minutes to enjoy my audiobook in the car. Getting stuck in the line at the grocery store is potentially an opportunity to connect with a person you would not have been able to interact. Losing the internet connection on your phone is an opportunity to look up from the screen to see the amazing creation around you. Sometimes that interruption is a gentle nudging by God to experience something greater. Instant anything is rarely better than the real deal. Instant my be convenient, but never as sweet. A slow and home-cooked meal is always better than fast food. What you loose in quick you gain in quality. The challenge for you is to focus on what you gain rather than what you lose when you are inconvenienced. I live a just outside busy Manhattan. When we take trips into the city, I enjoy people watching. Just grab a bench in Bryant Park and watch the people walk by. One word that describes Manhattan is busy. There is so much that is happening all at once. Maybe nothing gives me more a sense of peace than being in the middle of the busyness with nowhere to be and nothing to accomplish. So many of us are so focused on what we are doing, that we fail to notice everything around us. Be present in the moment. Look for ways you can slow down, so you start to see inconveniences as blessings rather than curses. Where do you find impatience in your life? How do you intentionally practice patience? What inconveniences in your life became blessings in disguise? Thanksgiving comes around once a year. It is a time to gather together with family. We watch some football and eat a nice meal. While the day is supposed to be about giving thanks, the actual practice of giving thanks is often neglected. The Apostle Paul says to give thanks in all circumstances. In other words, gratitude is something to be practiced every day. It is not something to be reserved for one day of the year at the end of November. It is much better to count your blessings than it is to wallow in your shortcomings. When you practice gratitude, you realize that life is not as bad as it might seem. You begin to see that life may be better than you perceive. Satan wants to rob your life of joy and will work overtime to make you blind you to the blessings God has granted. Gratitude will help you see the good things. Gratitude builds contentment. When you have contentment you will not feel the need to buy that latest and greatest gadget with money you don't have. The goal of advertising is to make you feel discontent with your life and convince you that buying the latest and greatest is the key to your happiness. But if you are already happy, you will realize you do not need it. When you practice gratitude, you will see you have much more in your favor than you realize. You will start to recognize the gifts God has given you to make a difference which you have taken for granted. You will begin to see God’s ability to empower you for more. Too often people lack trust in God’s ability to prosper them. But gratitude will work to conquer the fear of failure. As gratitude opens your eyes to see the world in a new way, you will begin to new see opportunities. Opportunities present themselves to those who have the eyes to see them. It’s not that you don’t have opportunities. It is that you don’t have the eyes to see them. As we are more attentive to God's work in our lives, we will see things we did not see before. We can easily take the people in our lives for granted. It might be our spouse, volunteers at church, or the waiter at the restaurant. We all enjoy being appreciated. We all relish when other people take notice of what we are doing. And other people will appreciate when you offer them gratitude. Expressing gratitude towards others can do amazing things in your relationships. Who can you express gratitude toward today? To whom can you show appreciation? Write a note. Send a message. Tell them in person. Let them know your appreciation. It will be a blessing to them. It will be a blessing to you. It will be a blessing to your relationship. It will be a blessing to God. Make a list of the things that you are grateful. Create a gratitude journal to keep each day. Write some thank you notes to people you appreciate.